The Victory Show at Cosby remains a popular and fascinating show and while bad weather at last year's event may have added an extra dimension to the realism for re-enactors, a waterlogged runway allied with an impractical display line meant that it was a show to forget for aviation enthusiasts. After much rumour and speculation, the 2018 show was eventually confirmed early in the year with an exciting array of participants lined up. Would the organisers be able to get this ever-popular event back on track in 2018? Ian Garfield reports from Foxlands Farm, Cosby. Additional images by Nick Jennings. Now in its 12th year, there really is no other event in the air show calendar than The Victory Show that has quite the mix of displays, both in the air and on land. It depicts not only the history of warfare of the 20th century but also the spirit of a time gone by and more importantly, remembrance of the sacrifice of those who gave so much in conflict. 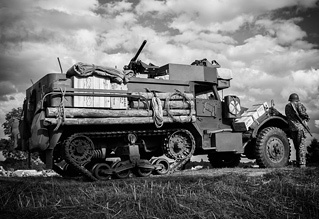 Hundreds of re-enactors from groups all over the country descend on to a working farm for one weekend every September, bringing with them vintage military vehicles, tanks, artillery and period weapons creating a multitude of settings that replicate some of the most famous eras of World War Two. Walking around the various dioramas adults and children alike are immersed in a world they may have only heard about or seen on TV. The completely friendly and relaxed atmosphere adds a little magic and re-enactors are only too happy to pose for photographs or explain more about 'their' story. It makes the whole event somewhat more educational rather than just for show. Where the Victory Show has really shone through is its flying display, attracting some spectacular participants in previous years including the Vulcan, the RNLAF Historical Flight B-25, Seafire and Blenheim. The photographic opportunities offered at the Victory Show were incomparable to any other show in the UK. 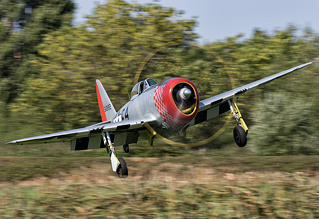 The small crowd line parallel to Foxlands Farm's grass strip runway offered take-off and landing shots of warbirds that you would not get at any other event anywhere in the country. In addition, the display axis meant aircraft swept round in a dramatic arc, viewable from all areas of the showground with topsides a-plenty. For these very reasons it was quite the well-kept secret of the air show calendar. Sadly the reformed CAA regulations put paid to this great show in 2016 with a display axis some distance away from showground itself, although take-off and landing shots were still possible albeit from a much reduced crowd area. And let's not even start on 2017! Bad weather meant that the grass strip was not operational, however the display line mandated by the CAA one day before the show itself was nigh-on impossible to fly. Despite negotiations right up until the last minute on the Saturday morning, the decision was made to reluctantly cancel the flying element to the show. This led to a backlash on social media and left a bitter taste in the mouths of visitors and enthusiasts alike. Bearing this in mind, nobody really knew what the display axis this year would be like, given confirmation that the CAA had approved two amended display lines for the show. Which one would be used would be dependent on whether a dwelling in the display area would be inhabited or not. 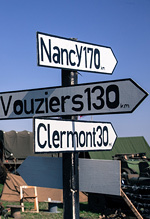 The highlight of the event each year is the colossal land-battle re-enactment, a perfectly choreographed event involving everything from tanks to half-tracks, jeeps to motorcycles and everything else in-between. This year was made extra special with the appearance of the C-47 Skytrain "Mayfly", operated by Aces High Ltd and sporting a fresh repaint, making two passes and dropping paratroopers on each run. Forgetting the crowds for one moment, it was a surreal moment listening to the roar of those mighty Wasp radial engines approach overhead and to then witness five round parachutes fall from the distinctive profile of the Skytrain. The moment was shattered by the roar of 'allied' artillery firing on 'German' positions in front of the gathered crowds just as the C-47 made two sweeping passes in an arc from each end of the runway, thus confirming the new display axis. Aircraft were much further away than the traditional display line, last used in 2015, and viewing – and essentially photographic opportunities – were only really viable from the northern end of the showground. This could have been a dilemma for some, sacrificing the favoured spot for take-off and landing photographs to solely view the flying display instead. However it was still possible to see aircraft take off, flare and ultimately land although in a much less dynamic manner. Locally-based Beech 18 "Good Vibrations" and Harvard "Dazzling Debs", the latter now sporting California ANG colours, started the flying display proper, performing a series of formation passes before the Beech 18 flew solo. The Texan then took centre-stage with some gentle aerobatics albeit some considerable distance and height from the crowdline. A surprise visitor was the Battle of Britain Memorial Flight Hurricane LF363, making an unscheduled flypast having displayed at Bournemouth earlier in the day. The Bucker Bestmann, Hispano Buchon and Hurricane Mk.1 P2902 took off and performed a mock tailchase with the Hurricane initially chasing the Bestmann, trailing smoke on several passes. The Buchon appeared from high-level to then get the upper hand on the Hurricane. The same scene was repeated with The Grace Spitfire ML407 and Spitfire MK VC EE602 again performing a tailchase display before both Spitfires, Hurricane and Buchon performed a final formation pass. The distinctive silhouette of B-17 "Sally B" loomed on the horizon, and as it positioned ready for its first pass it did look like the remaining warbirds would formate and create quite a formation, flying alongside the Flying Fortress. Sadly this was not the case, as the warbirds departed for home, leaving Sally B in the limelight for the next few minutes. 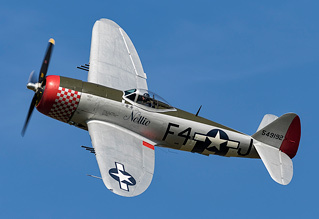 Carrying on with the American theme, the USAAF contingent followed with TF-51D Mustang "Contrary Mary" and P-51D Mustang "Miss Helen" airborne with Buchon "White 9" (which had flown following overhaul just two months prior) and arguably the star of the show, P-47D Thunderbolt "Nellie". 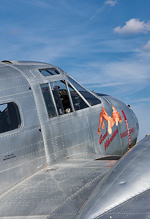 It was great to see these warbirds in the sky, but it became apparent that there was very little the aircraft could do other than fly along the curved display axis. 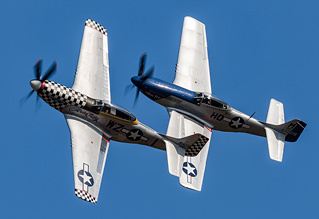 There were several formation flights in this section, first from the American trio and subsequently the Mustang pair but apart from that, it was what seemed like a never-ending cycle of simple passes, right to left repeatedly. 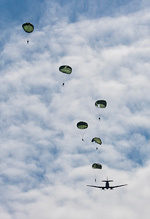 The display concluded with two passes from all assembled aircraft before all four departed for home. Unlike previous years, there was plenty of room on the banks surrounding the battlefield area. At the northern end of the showground, which was considered the place to watch the flying display from, there was unusually plenty of crowd line space all throughout the flying display. Car parks 3 and 4 were to be sterile when flying commenced but it appears that both were actually empty, perhaps confirming that visitor numbers were less than anticipated. Overall the flying display was nothing out of the ordinary. There was no real sense of thrill or excitement to any display that one would normally see from the same aircraft at a similar venue like Shuttleworth, for example, and it seems the Victory Show has essentially become a terrific re-enactment show with a few old war planes flying about to boot. For the photographers however the whole show contained perfect light and top-side passes for every single aircraft, the only downside being that there were visible variances in display height and crowd separation in each display. Of course, the air display is only a small part of the whole show itself, that fact must be remembered. There is so much more to see and do throughout the whole day, with the flying element taking up only an hour-and-a-half each afternoon. Furthermore, the organisers have done an exceptional job with what they have at their disposal, making a very tight boundary into a useable display area. Thankfully, their perseverance has meant that the flying element has remained, albeit now in an abridged form. In addition, commentary from Tim Callaway was informative and concise throughout. 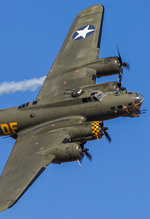 However, it's abundantly clear from this year's display that the Victory Show no longer holds the reputation for being the unassuming gem of the air show calendar. Regardless, it is a still great day out and at £18 for adults plus £2 for a programme, a truly enjoyable time is guaranteed for all, whether young or old. It's highly doubtful now that we will ever see a return to the displays of only a few years ago but enthusiasts and visitors must be grateful that organisers truly want the event to succeed as much as we do.